In this bracing, page-turning account of his stranger-than-fiction baptism into the corrupted ways of Washington, Neil Barofsky offers an irrefutable indictment, from an insider of the Bush and Obama administrations, of the mishandling of the $700 billion TARP bailout fund. In vivid behind-the-scenes detail, he reveals proof of the extreme degree to which our government officials bent over backward to serve the interests of Wall Street firms at the expense of the broader public—and at the expense of effective financial reform. During the height of the financial crisis in 2008, Barofsky gave up his job as a prosecutor in the esteemed U.S. Attorney’s Office in New York City, where he had convicted drug kingpins, Wall Street executives, and perpetrators of mortgage fraud, to become the special inspector general in charge of oversight of the spending of the bailout money. From his first day on the job, his efforts to protect against fraud and to hold the big banks accountable for how they spent taxpayer money were met with outright hostility from the Treasury officials in charge of the bailouts. Barofsky discloses how, in serving the interests of the banks, Treasury Secretary Timothy Geithner and his team worked with Wall Street executives to design programs that would funnel vast amounts of taxpayer money to their firms and would have allowed them to game the markets and make huge profits with almost no risk and no accountability, while repeatedly fighting Barofsky’s efforts to put the necessary fraud protections in place. His investigations also uncovered abject mismanagement of the bailout of insurance giant AIG and Geithner’s decision to allow the payment of millions of dollars in bonuses—including $7,700 to a kitchen worker and $7,000 to a mail room assistant—and that the Obama administration’s “TARP czar” lobbied for the executives to retain their high pay. Providing stark details about how, meanwhile, the interests of homeowners and the broader public were betrayed, Barofsky recounts how Geithner and his team steadfastly failed to fix glaring flaws in the Obama administration’s homeowner relief program pointed out by Barofsky and other bailout watchdogs, rejecting anti-fraud measures, which unleashed a wave of abuses by mortgage providers against homeowners, even causing some who would not have lost their homes otherwise to go into foreclosure. Ultimately only a small fraction (just $1.4 billion at the time he stepped down) of the $50 billion allocated to help homeowners was spent, while the funds expended to prop up the financial system—as Barofsky discloses—totaled $4.7 trillion. As Barofsky raised the alarm about the bailout failures, he met with obstruction of his investigations, and he recounts in blow-by-blow detail how an increasingly aggressive war was waged against his efforts, with even the White House launching a broadside against him. 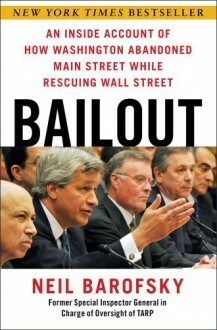 Bailout is a riveting account of his plunge into the political meat grinder of Washington, as well as a vital revelation of just how captured by Wall Street our political system is and why the too-big-to-fail banks have only become bigger and more dangerous in the wake of the crisis. *** FROM BAILOUT The further we dug into the way TARP was being administered, the more obvious it became that Treasury applied a consistent double standard. In the late fall of 2009, as I began receiving the results of two of our most important audits, the contradiction couldn’t have been more glaring. When providing the largest financial institutions with bailout money, Treasury made almost no effort to hold them accountable, and the bounteous terms delivered by the government seemed to border on being corrupt. For those institutions, no effort was spared, with government officials often defending their generosity by kneeling at the altar of the “sanctity of contracts.” Meanwhile, an entirely different set of rules applied for home- owners and businesses that were most assuredly small enough to fail. Nowhere was the favoritism toward Wall Street more evident than with the government’s approach to AIG, where inviolable contract terms were cited to justify the absurd executive bonus payments as well as far richer payouts provided to the megabank counterparties to AIG’s CDS deals, honoring even their most reckless bets. For homeowners and small business owners, though, contracts went from being sacrosanct to inconvenient irrelevancies. So when mortgage servicers blatantly disregarded HAMP contracts by trampling over homeowners’ rights, Treasury turned to an endless series of excuses to justify its refusal to hold them accountable. Similarly, for more than two thousand auto dealerships, Treasury’s auto bailout team sought to void the contractual rights granted them under state franchise laws to shut them down.